In S.C., impeachment is for "cases of serious crimes or serious misconduct"
Democratic Minority Leader Harry Ott says he's keeping option "on the table"
COLUMBIA, South Carolina (CNN) -- With South Carolina Gov. Mark Sanford showing no sign that he plans to quit, only one option may be left for critics who want him gone: impeachment. Lawmakers say Gov. 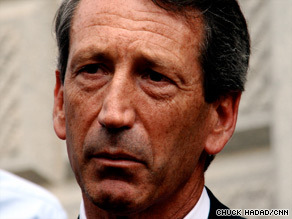 Mark Sanford won't be impeached unless evidence shows he broke the law or abused power. But legislators on both sides of the aisle in South Carolina believe that the chances of ousting Sanford with an impeachment vote are slim, unless new evidence arises showing that the governor broke the law or abused his power by secretly leaving the state to visit his mistress. Democrats, long in the minority in both the state House and Senate, won't have the votes to pass such a measure when the legislature reconvenes in January. And Republicans appear to have little appetite for another embarrassing political mess, especially in an election year. Perhaps most important: Members of both parties say that for the time being, there is little evidence that Sanford did anything impeachable. "If he decides to open his mouth again, and starts telling us about other revelations, then maybe something will come up," said Democratic state Rep. Boyd Brown. "But right now I don't see it." The power of impeachment in South Carolina, according to the state constitution, is reserved for "cases of serious crimes or serious misconduct in office." In that state, the impeachment process begins in the House of Representatives. A motion to impeach can be introduced by just one legislator, but the motion would then need to survive a two-thirds vote before being sent to the Senate. After impeachment proceedings, the Senate would also need two-thirds of its members to vote to remove the governor from office. Harry Ott, the Democratic minority leader in the House, said he is keeping the impeachment option "on the table" because he hopes any further investigation into Sanford's activities might reveal new information. The State Law Enforcement Division reviewed Sanford's finances last week, but concluded that he did not use any state money improperly while carrying on his affair. Ott acknowledged that it would be difficult to push for impeachment if nothing else comes to light. "I think that if no other information comes out between now and January, and if the governor has demonstrated an ability to do the job people have elected him to do, then I don't think there would be a large call for impeachment at this point," he said. Kenny Bingham, the Republican House majority leader, said Democrats might offer a motion for impeachment next January simply to draw more negative attention to the GOP during the 2010 governor's race. He said the term "serious misconduct" could give Democrats some wiggle room to mount a charge against Sanford and his party. "That's a wide-open term," Bingham said. "What he did with leaving the state and not telling anyone and not having anyone in charge, is that serious misconduct? To some people that is." Sanford has taken some of the toughest blows from members of his own party during the two-week saga. But even Republicans who have been vocal in calling for Sanford to step down appear unwilling to try to force him from office. "My gut feeling is I don't think impeachment is going to happen," said state Rep. Lanny Littlejohn, who was among the first Republican legislators to ask Sanford to resign after the scandal broke. "I don't know if there would be enough votes there to do that." The sentiment isn't limited to lawmakers. On Monday, the state Republican Party executive committee -- comprised of GOP activists from around the state - voted to censure Sanford. In a statement released shortly after the internal party vote, party chairwoman Karen Floyd said Republicans should move on from the scandal. Rich Bolen, the chairman of the Lexington County Republican Party, said although many conservative activists think Sanford should resign on his own accord, few want him to be impeached. He said the state party's censure resolution captured the sentiment of party members. "We want there to be consequences, but we also want to recognize that we don't want to put the state through more tumult to make a point," Bolen said. Former state GOP chairman Katon Dawson, who has been critical of Sanford, said Republicans and Democrats have little choice if Sanford decides to dig in for the remainder of his term. "It's always been in Sanford's corner to decide whether to go or stay," said Katon Dawson, the former state GOP chairman. "Public opinion is pretty loud on Sanford, but that is not enough to overturn an election, and that is what you're talking about with impeachment, overturning an election."